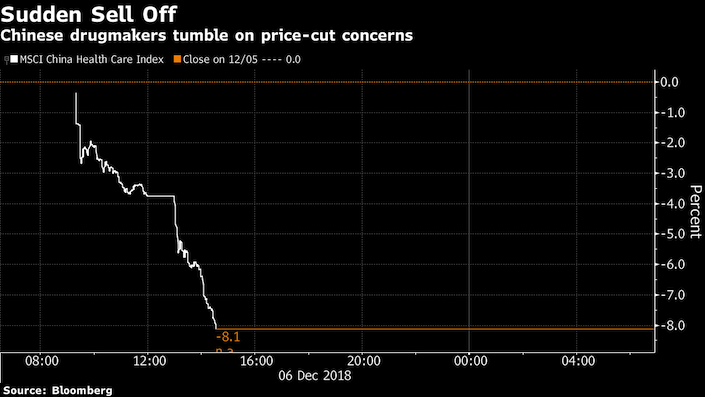 Chinese drug stocks headed for their worst drop in almost a decade amid concern the government is driving down prices for their products via a centralized procurement program. The MSCI China Health Care Index plunged 8.1 percent at 2:34 p.m. in Hong Kong, with Sino Biopharmaceutical Ltd. sliding 14 percent. Much of the declines came after the midday break. Prices on drugs that made into a government procurement list were cut substantially, the Shanghai Securities News reported, citing preliminary tender results. The price for one hepatitis B drug was cut by 90 percent and the price of another made by Jiangsu Hengrui Medicine Co. was reduced by 60 percent, according to the report. The selloff is caused by speculation that a company had to lower their price by up to 90 percent to win a government bid, Kelvin Chen, a Bocom International analyst, said by phone. That triggered concern that companies involved in the bulk purchase scheme will have to massively cut prices to win orders.